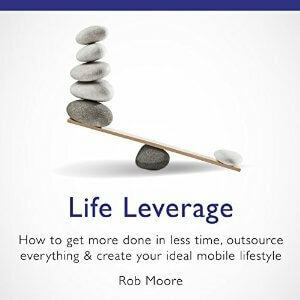 The Money Podcast by bestselling author of Money, Rob Moore, dives into how to make, manage and master money. How to know more, make more and give more, how to save, invest and raise money. The Money Podcast is for anyone who wants to make more money in a job, profession or passion, for money masters and money disasters. They say money doesn’t make you happy. Rob says it does. I’m feeling pretty guilty at the moment. I often feel this guilt in this situation. I’ve just come off a one-to-one coaching call with someone. I was quite brutal with them. I’m going to explain why and some of the things we’ve covered, and why I think you really need to know this. So, I was having a one-to-one coaching call while doing a workout at the same time. Hence the gym gear. This person, his wife has a health business. So, she does retreat once a year. It’s a fairly fledgling business. I guess they have only done one or two. He said, that they don’t make any money on them, like you’re not allowed to, like it’s wrong to. They do a lot of work and a lot of marketing. They tend to have clients who want to do long-term payment plans. They struggle to get in all the money even for one retreat a year for 8 people. Then I said, how much is it? He said, 1,500 quid. My jaw hit the floor, and I was like, okay, how long is this for? Is it like an hour’s retreat? He said, no, it’s a week. I said, where is it? He said, in Ibiza. I said, please don’t tell me, that you also cover some of their expenses in it. He went, yeah, we cover all of their accommodation and all of their food. I was just like, mate, this has got to stop. Yeah, I was pretty brutal. I think I made up with them at the end. Obviously, I wanted to help. So, I think I came from the right space. But a few things about this. So, here are some of the objections and belief restrictions in this area. So, it’s the health industry. So, people don’t pay huge amounts of money for retreats. We’ve looked into all the competitors and all the other people are charging the same kind of money. My wife hasn’t been doing it very long. She’s not like, a big perceived expert. So, there are all these objections and doubts as to why it shouldn’t be more than 1,500 quid. But 1,500 quid for a week with paying for food and expenses is probably going to be net about 600 quid per person. You’re not even going to cover expenses. You’re going to be in negative margin. So, number one is you are allowed to make a profit. In fact, it is your obligation as a business, as a company to make a profit. If you don’t make a profit, you’re insolvent. Being in trading, insolvent is illegal. You can actually go to prison for that. If you are insolvent or unprofitable, then you can’t create new products and services for new people. You can’t deliver on products and services you promised to existing people. Therefore, your business doesn’t work. No business is a charity. You’re allowed to make a good fair profit margin, sustainably over a long period of time. You’re allowed to make 20 percent. When you start, you’re allowed to make 50 percent. When you’ve been going for 30, 40 years, you turn over billions, you might make 3 percent. But you’re allowed to make a good lump of money, number 1. So, the next thing, is, ah, we’ve looked into all the other competitors. They are all charging that much. That’s like being a cow, and going in this fence full of cows, and looking at all the other cows and going, oh, well, the only animal on the planet is a cow. When in reality, there is millions of different types of animals. So, I said to this person I was coaching. I want to keep it confidential, because I haven’t got their permission to talk about this. So, I’m not naming them. Therefore, that’s okay. In fact, they would probably be happy I’ve done this episode on it. So, my son and daughter go to a private school. Virtually, every mom at the private school could afford to pay double or quadruple what this nutrition business is charging for their retreats. There are plenty of moms who just look after their children full time, who maybe could do with some nutritional help or retreat. Maybe they are not as fit and healthy as they could be. There are plenty of moms who do yoga already, and who are fit and healthy, who want to be more fit and healthy. When you infiltrate one, you infiltrate them all, because they all tend to know each other very well. It’s easy to spot who the wealthy ones are, well pretty much all of them, because you just look at the cars that they get out of. There are celebrity moms. I said to this person, Oprah Winfrey is not going to be your client, because she’s going to think that 1,500 quid, is way too cheap. She’d probably pay 150 grand for the right kind of retreat for a week in the right kind of place. So, the competitors they are looking at, they are only looking at the base, smallest competitors. They are not looking at the whole market. So, when you’re pricing your products and services, you’ve got to look at the whole market. Don’t be a cow going in a small fence full of cows, and assume that’s the only business out there. I interviewed on my Disruptive Entrepreneur Podcast, Martin Frei who co-founded Urwerk, the watch manufacturer. Now, they make watches for hundreds of thousands of pounds. Now, if you wear a Casio, you think the only watches are the Casio, and Timex, and whatever. But there are watches, there are huge watch companies, Greubel Forsey, Audemars Piguet, Jacob & Co., Urwerk, Ressence. They make watches at 15, 20, 50, 100, 200 and £500,000. Patek make watches for £1 million. Now, someone who buys a 50 grand watch is quite easy to target. So, this was the next thing that I covered with the client. Well, I don’t really know where or who to target. Well, until you’re clear who your ideal client avatar is, then you’re going to have no idea who to target. So, I suggested to this person, that why don’t they target busy, affluent moms? Not 17-year-old single moms, nothing wrong with that. But that’s a different market. You target busy, affluent moms, or moms of successful business people, or successful mompreneurs. These are the people that you target. That’s easy. You just put that into your communication. So, if I was Audemars Piguet or Urwerk, and I was making watches from 50 grand to 5 million quid, I would target people who’ve got 3 watches or more. I would target people who buy Ferraris and Lamborghinis. I would target people who are on all the rich list groups on Facebook, and follow all the rich listers on Instagram, et cetera, and subscribe to all the affluent magazines, and go to the boat shows. Maybe do a joint venture with sun seeker or high-end stereo manufacturing. You know like, when Range Rovers and Porsches and stuff like that, the higher end models do joint ventures. So, you can get an upgrade to a Bose, but then you can get Meridian and you can get Burmester. You can get Naim in a Bentley. So, they know that if they put hi-fi in a Bentley and Meridian and Burmester put high-end hi-fi in 150 grand car, the person who is driving that car is probably going to go and buy Meridian or a Naim hi-fi system, which would probably be 15 or 20 grand. So, with your business and your pricing, you attract who you’re targeting. If you’re not targeting anyone, you’ll probably attract the customers who want a tenner for a fiver. Now, here’s the thing. The only thing that is stopping you doing it, is that, you perceive you have no more clients. You perceive that there aren’t people out there that will pay the money. So, what you do, is, attract the people who want a tenner for a fiver. Now, with those clients, they are the hardest to admin. They take the most amount of time to deal with. They are where most of your complaints come from. They are the biggest stress on your overhead, because all the time in admin, and the resource that you have to put into keeping them happy, even though you kind of never make them happy. That all has an overhead cost. So, as soon as you get rid of those clients, and you get the more affluent client who goes, yeah, I’ll pay upfront, don’t worry about it. Yeah, just send the details to PA. She’ll book all the flights and the accommodation, blah, blah, blah. They are the easier clients to deal with. So, do you know what? The world isn’t just what you see. The prices that you charge aren’t the maximum ceiling of prices that they could be charged. Now, some people say to me, well Rob, I’m an accountant, or I’m a surveyor, or I have this widget. They say you can’t go over that price. Well, show me any industry, where there’s no one particular type of business that hasn’t busted the price ceiling. I’ll look into it for you. I’ll get my researcher to look into it for you. I think I can prove to you that there are. I’ll give you an example, hairdressing. So, 12-15 quid might be for a basic haircut in Peterborough, 30 or 40 quid might be for a women’s cut. I’m pretty much out of touch. Mine is 8 quid, look at it. It’s probably worth about 4 quid. There is a hairdresser, who gets flown out by the Sultan of Brunei to do his hair. He gets paid £5,000 plus travel and expenses. So, for every widget that costs 50 quid, there’s someone who charges 500 quid, 5 grand, 50 grand, 500 grand. Phones, you can get cheap phones. Apple just brought out their most expensive phone, which is 1,400 quid. 1,400 quid for a phone. Do you remember when you can get a phone for free as long as you took out a 12-month contract? Now, Apple are charging 1,200 quid. People who haven’t got the money and can’t afford it, are buying 1,400 phones, or 1,449. Ben has just said that on the Facebook Live at the same time as I said it. Good timing, Ben. So, I challenge you to increase your price ceiling. So, I’ve got a Record Deck over there. Now, the cartridge, a standard cartridge, which is the needle might cost you 15 or 20 quid. Koetsu make one for 10 grand, the little needle on the box is about that big. They make a 10-grand cartridge, when the normal one might be 15 quid. Now, how many of them do you have to sell to make a good profit margin? Not many. You can make them by hand. You can attract really good quality of clients and customers. Clothing, you can buy clothing in Primark, or you can buy clothing that’s thousands and thousands of pounds. I wanted to buy a new pair of trainers. I was thinking like, an expensive pair might be 150 quid. I’m out of touch. I went on farfetch.com. It’s where I buy a lot of my clothes online. I search trainers, and I put highest first. There are some trainers for 12,000 quid. Like there are some Nike trainers for 5 grand, Nike trainers. Ah, but it’s a brand endorsement with OFY, or it’s a limited edition, or whatever. I wouldn’t wear a pair of 12 grand trainers. I would put them in a safe. I’d just look at them. But 12 grand for a pair of trainers that you could probably get for 30 quid that does the same thing. I know what business I’d rather be in. I’d rather be in the business, which yes, it’s slightly lower volume, but it’s higher margin, higher prices with higher quality of clients. So, I challenge you to (1) readdress your customer avatar, your ideal client, to be specific about the kind of clients that you want to attract, and then put your prices up. I always say to people, the easiest way to double your money is to put your prices up. Now, if your product is a grand, and you make 200 quid. If you put your product up 20 percent to 1,200 quid, you’ve actually doubled your profit, because your profit has gone from 200 quid to 400 quid. So, putting your prices up 20 percent can double your profits, and make them 100 percent higher. That’s pretty cool. That’s not that hard to do. All your current overhead and all your costs, fixed and variable are factored into your current prices. So, when you put your prices up, as long as there’s not a dramatic increase in marketing, there’s virtually no extra cost for that extra margin. Now, think about this. Like, if I said to you, double your prices, you would worry about it. Well, all that would probably happen is for a bit, it will be bit harder. You will repel some of your worst clients. You will start noticing that the world brings you more affluent clients. Because Oprah Winfrey would not pay 1,500 quid including expenses for a week’s retreat. She would assume that’s full of cockroaches. She would assume that the person doesn’t know what they are talking about, because that’s how she would perceive it. Yeah, okay, she might pay 150 grand for a retreat, but other people might not. Other people would pay 5 grand or 10 grand. They wouldn’t even bat an eyelid about that. But if you have some kind of phobia or internal issues around banging your prices up, because it relates to your self-worth, or you don’t believe you are credible or whatever, then I think that’s the reason you should do it. But I challenge you to do it a different way. I would incrementally increase your prices. So, I would use the Price Escalation Model. So, back 8 years ago when I launched my first Mastermind Programme. So, it was like, a year-long Mastermind, where Mark and I, were property mentors. It was 2 grand plus VAT and you’ve got us as your personal mentors. Then what we did was it went up to 2.2, then 2.5, then 3, then 3.5, then 4, then 4.5. Now, it’s £50,000, and there’s a waiting list. It’s probably sold out for the next 6 months. But I didn’t go from 2 grand to 50 grand. Of course, in those 7 years, I’ve built a lot of credibility. I’ve bought more than 700 houses, built a brand, got well known. But what I started to notice at a certain point. That might have been when it was 5 grand or 10 grand. I can’t remember exactly. I was like, wow, I’m starting to get some affluent clients. This person has got a few hundred grand in the bank to invest. Whereas when I first started, I was attracting people who were putting the money on the credit card, or wanted to do no money down deals, or joint ventures. As you increase your prices, your ideal clients appear, because you’ve been repelling them because your prices are too low. If you said to me, hi Rob, do you want to buy this Casio watch for 30 quid? No, because it’s too cheap. I’m sure in certain areas of your life, where you have a higher discerning taste, sounded a bit like a snob when I said that. But you know what I mean, in areas where you value things. You might want to live in a certain area, which is higher than a certain area. You might want a certain car that is higher than a certain car, because we all have higher values in different areas of our lives. So, start nudging your prices up incrementally. So, the first thing you do, is, when you get to the VAT threshold, you have the VAT. The second thing you do, is, you take all the expenses out. I’d probably start banging it 20 percent incrementally. Then redoing your marketing, and then attracting your clients. Then giving yourself the evidence, and then go up 20 percent, 20 percent, 20 percent. I just realised, I literally blurted at you for like, 15 minutes. But yeah, that’s kind of how I do it.